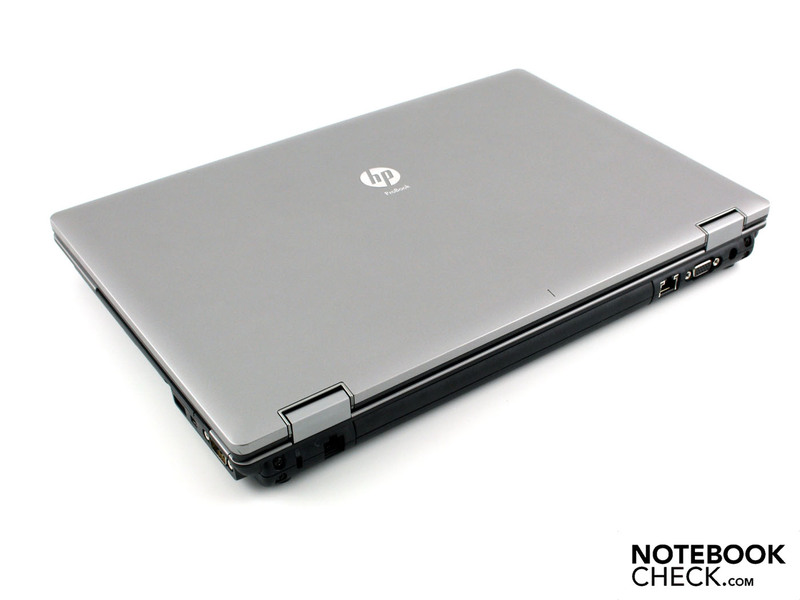 In April 2010, the HP ProBook 6540b WD690EA underwent one of our comprehensive reviews. The Intel-based 15.6 incher with Core i5 430M (2.26 Gigahertz impressed us all around and earned itself an A grade mark with 89 points. More distributors have listed AMD-based notebooks in the last few months. Among those are also many ProBook models, which are priced somewhat lower compared to the Intel machines. A ProBook 6540b with Core i5-430M, IGP graphics, UMTS and WXGA resolution costs around 1,030 Euro. The 6555b before us with Phenom II X3 N830 and otherwise identical technical specifications costs 850 Euro at this time. Is the 180 Euro premium for the Intel CPU worth it, or should those office users opt to take their wives out for dinner three times instead? Does the battery life suffer with the AMD equipment and how do things look in terms of system performance? You'll find all the answers to these questions in our comprehensive review. 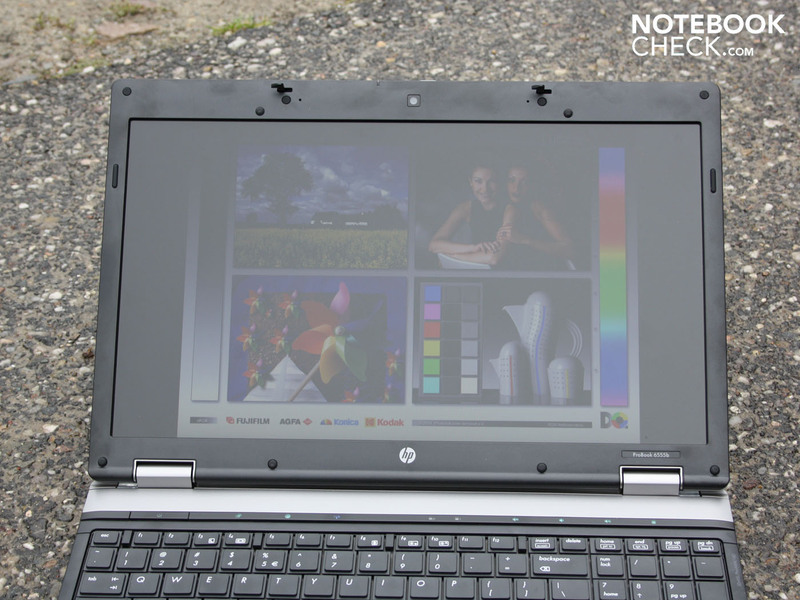 Note: The HP ProBook 6540b WD690EA we tested in April can't be put in a 1-to-1 comparison with our 6555b tester due to differences in equipment (different display panel, 1600x900 pixels, ATI Mobility Radeon HD 4550). Still, we nevertheless dare to say whether or not the AMD variant can hold its own or not. 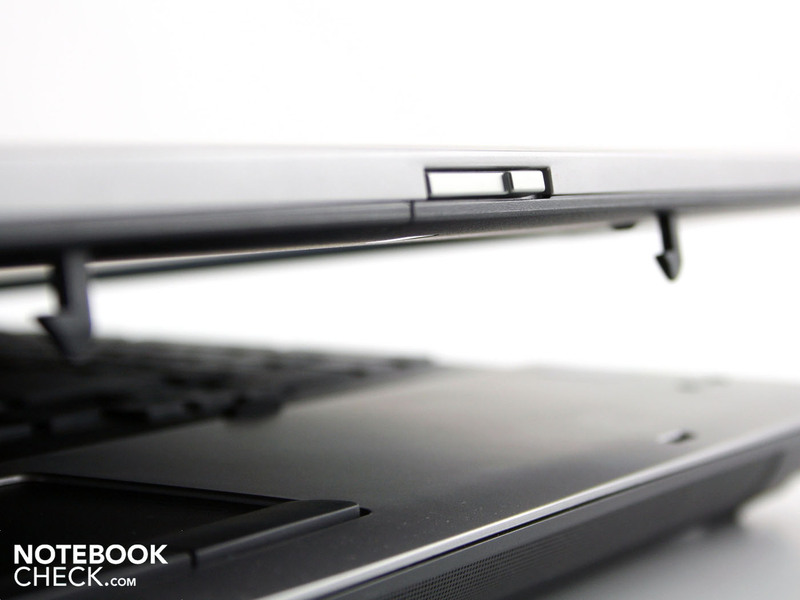 A simply structured, but still stable construction is a strength of the ProBook 6555b. At 2.727 grams, the heavy case doesn't try to hide its 15.6" form factor. It fact, the opposite is the case. In order to expand the palm rest and the working area, this surface was widened around three (right and left) to six millimeters (front). This results in a very large palm rest. With both hands gripping the front corners, the chassis can be twisted slightly, but we don't hear any creaking. Under the DVD driver, the base plate can be dented noticeably, but the user has to press quite hard to achieve this. The other surfaces of the base plate, including the service flap, are resistant to any torsional twisting. But our critique falls silent in terms of the two metal hinges. 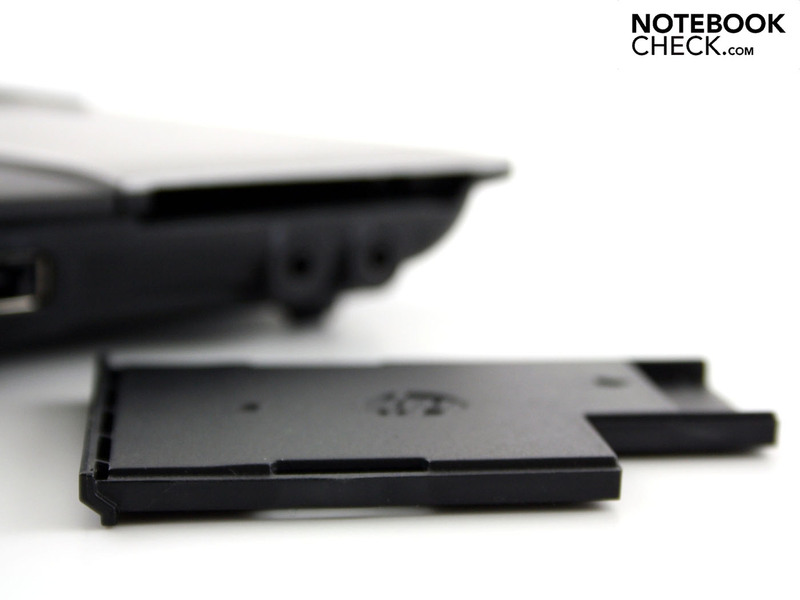 Although they sit on the outer edge of the base unit, the connection to the chassis is flawlessly stiff. The joints hold the wide display securely in place. On bumpy car rides, the lid only tends to wobble a tiny bit. Its surface is made of a matte plastic which can be noticeably dented. The lid offers no protection from scratching, but it does do a fine job of warding off finger smudges. Like in the old days of the first mainstream notebooks, the lid can be locked closed to the base unit. 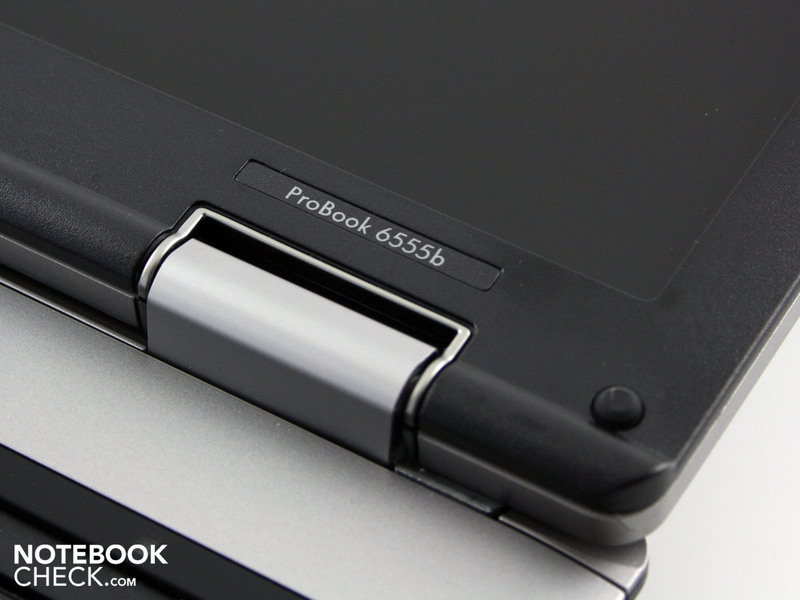 The ProBook 6555b has two latching hooks made of plastic and a slide bar for opening on the upper edge of the display. When closing the lid, the user is given an audible reminder that he is done with his work for the day. The plastic material doesn't promise the longest lifespan of the locking mechanism. 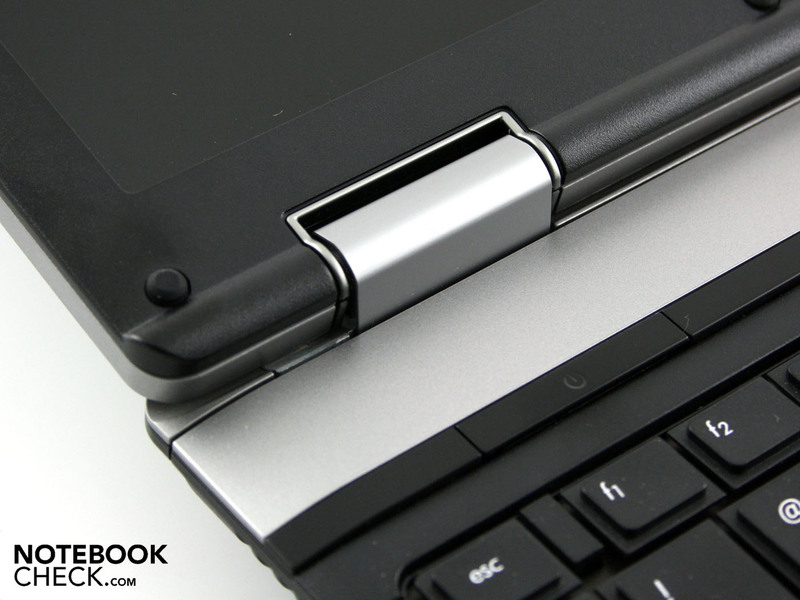 This represents a difference from the HP EliteBooks, whose hooks are made of metal. 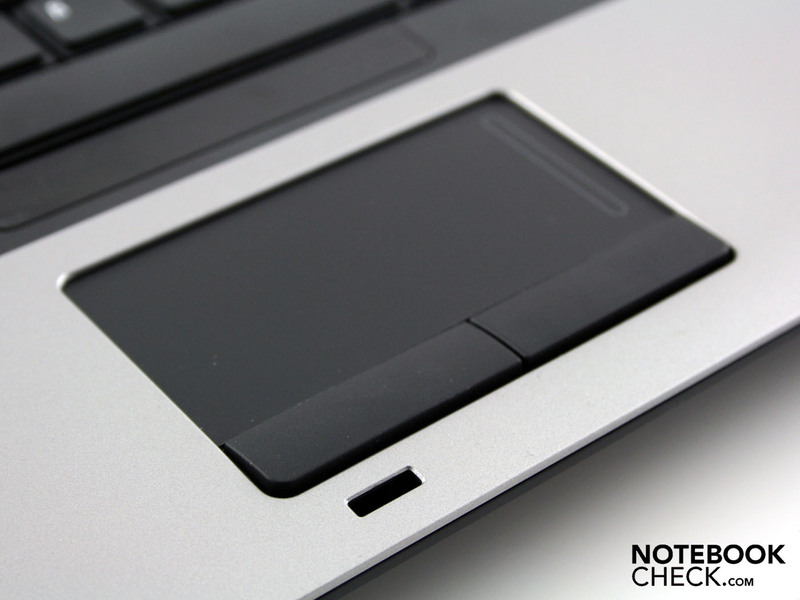 The manual locking mechanism, which is pretty much extinct on consumer laptops as well as on many business laptops, protects the display panel. No small particles can slide their way in during transport. 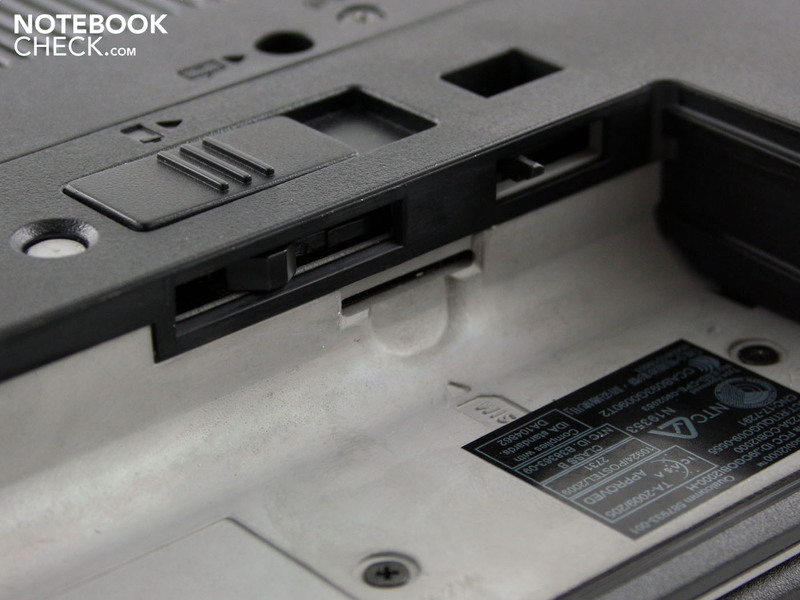 Demanding users will appreciate the numerous connection options on the ProBook 6555b. Thanks to the conventional mounting of the lid, there are even connections at the rear. Next to the modem port (RJ-11), a Kensington lock as well as an Ethernet and a VGA port are also found here. The power input is unfortunately bolt upright and thus more cumbersome than necessary. A partition of the back side disencumbers the side pieces optically. On the left side, the battery of three USB ports, eSATA and the display port offers a novelty. 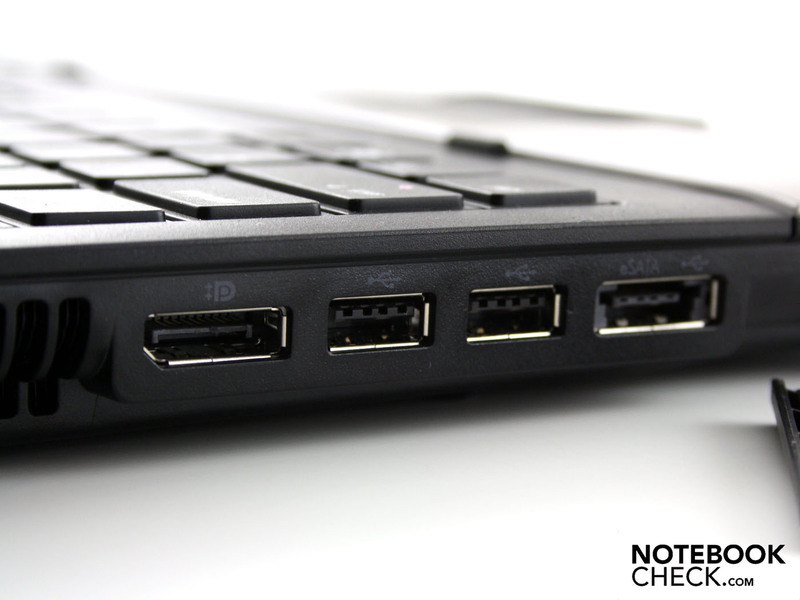 It is a combined USB/eSATA, which is not available on the Probook 6540b WD690EA. The Display port is preferred by professional users as it enables an external display with 2.560 x 1.600 pixels to be hooked up. HDMI allows at best 2.160p (HDMI1.4a). The now rare ExpressCard54 port makes the 15.6 incher extendable. Interface cards, TV cards or flash memories can be plugged in here. ExpressCard/34 cards also fit in here. Two audio inlets and outlets are found directly under the slot, but the digital SPDIF is not among these. The right side offers a seemingly outdated interface in the form of a screwable serial connection (Com-Port, RS232, 9 pin). Before, input devices like a mouse or joystick were connected here. Consumers won't have any use for the RS232. Pro users in the industry still use serial interfaces, but today only for data acquisition or for controlling machines. More interesting for the average user is FireWire (i.LINK). 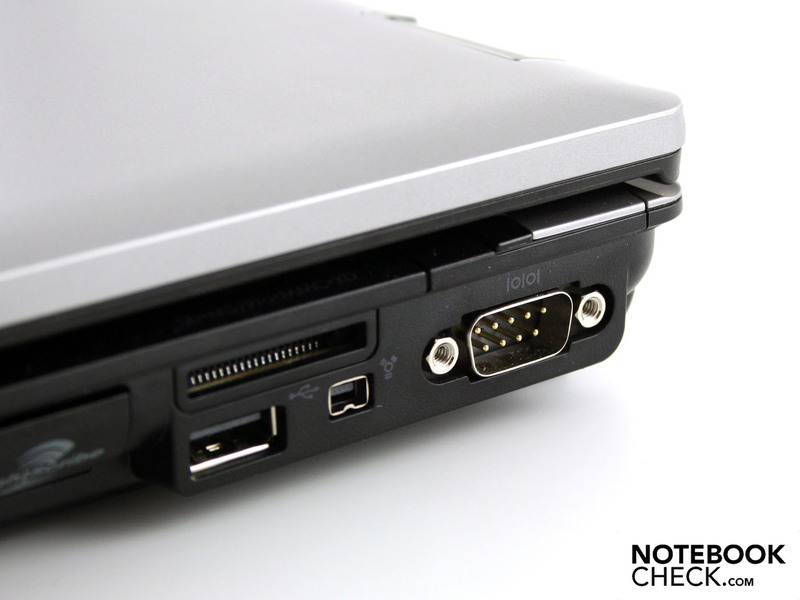 This port connects to camcorders or external harddrives (also eSATA, left) and offers higher data throughput than USB 2.0. Finally, there is also a CardReader and a fourth USB port on the right side of the case. The DVD burner has a special feature with the LightScribe: It is technology developed by HP and Lite-On for inscribing CVs or DVDs (DL). Employing the corresponding double-layer DVD+Rs with the LightScribe surface means there is no need for stick-on labels. All the normal burning tools support this procedure (Ashampoo Burning Studio, Ahead: Nero, Roxio: Easy Media Creator 8, etc.). 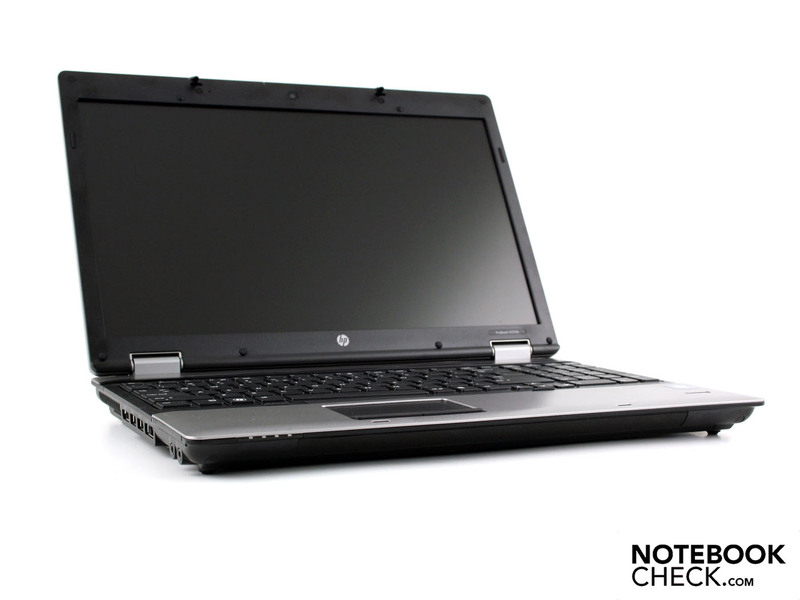 The HP 6555b wouldn't be a real business notebook without a fitting docking solution. This relieves the user of annoying plugging-and unplugging when transporting the laptop. The HP NZ223AA Advanced Dockingstation fits for around 210 Euro. The large docking solution offers an integrated SATA expansion shaft for additional harddrives. This dock commands almost all connections of the notebook on the table, including eSATA and serial. There is also a parallel port. There is also the basic variant HP Dockingstation VB043AA (starting at 190 Euro, without internal SATA) with 4 x USB 2.0 4, DisplayPort, DVI and VGA. 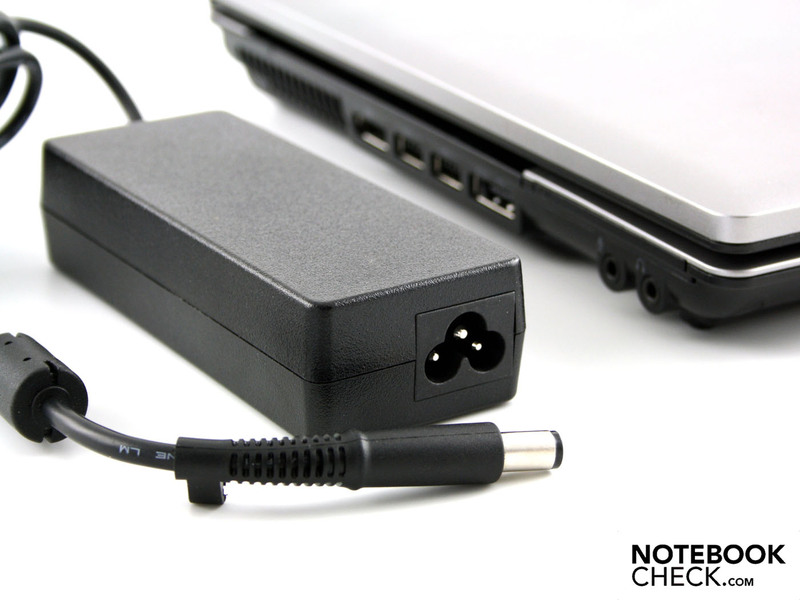 The docks have their own power supply which also supplies the notebook. On the base plate there is also a covered battery connection. In order to increase the operating time, one can connect either the travel battery for extended runtimes (AJ359ET) or the 12 cell battery with an extremely high capacity (AT486AA). It is a kind of battery slice which is clamped on to the base unit. HP claims an additional 10 hours of operating time with the 12 cell slice. Considering the so-so runtime of just three hours (WLAN) with the standard battery, we think this claim is somewhat overly optimistic. In addition to WLAN Draft-n (Broadcom 802.11n), just about all available radio technologies are found in the 6555b. Bluetooth 2.1 is almost obligatory. It gets interesting with the HP Mobile Broadband module (mini PCI Express, HSDPA), which has GPS functionality. Determining one's location is realized via a Gobi2000 module (A-GPS, assisted GPS and gpsOneXTRA). The GPS receiver enables tasks relating to location such as navigation or geofencing. The HP Connection Manager 3.1 combines the handling of WLAN/WiFi, Bluetooth and HSDPA in a single tool. After installing a SimCard, the connection was made immediately. Unfortunately, the SimCard sits so securely in the small slot that we needed small forceps to get it out. Those who use SmartCards in their business for personalized log-in can plug in an optional reading device in the ExpressCard54 slot. The BIOS can be protected with a password and a TPM 1.2 Embedded Security Chip including Enhanced DriveLock is on board. TPM is a passive chip with a cryptographic key for precise identification of the machine. Correspondingly for administration of the operating system, there is a Trusted Computing Platform which can no longer be used against the interests of the owner or administrator (topic in large corporations). There are also tools like the HP disc sanitizer (deletes data completely) and a slash-guarded keyboard with a drain gutter. HP didn't skimp on the tools and in addition to a recovery manager, the ProtectTools security manager is also on duty. With this, the security settings can be controlled centrally. For system recovery, there are Windows 7 & XP SP3 recovery DVDs. 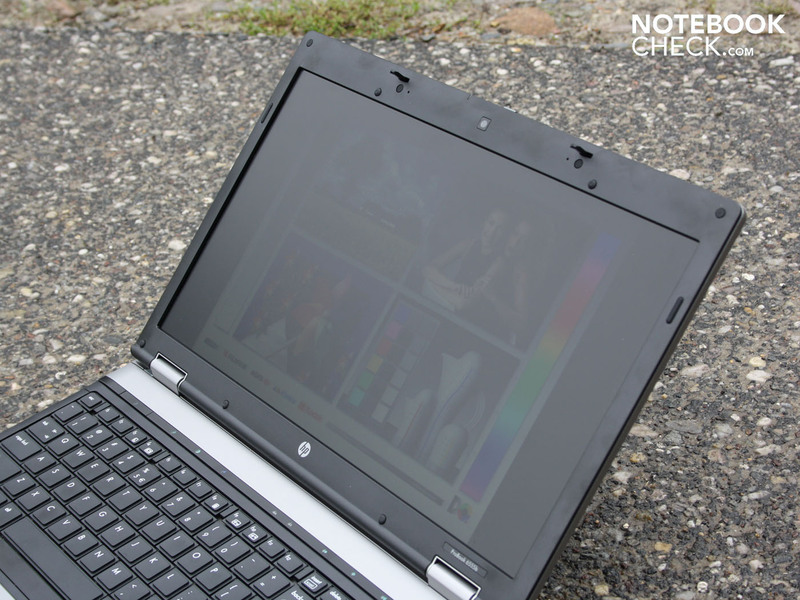 HP offers a 12 month guarantee for its ProBooks (also on the main battery), whereby in that case on has to send in the notebook themselves (country dependent). The manufacturer charges a lofty 268 Euro for the guarantee upgrade to 3 years on-sight service by the next working days. The keys of our British keyboard offer a clear pressure point, a long key hub and a solid stroke. The key bed sits securely across the entire surface. Only the lower part of the numeric keypad gives a bit under pressure. Though the offset arrow keys are rather tiny, they still impress us. Our fingers can discern them from feel alone, which limits false inputs. The space between the keys is not as large as on desktop inputs as the integrated and slightly offset numeric keypad takes up some space. With a width of 14 mm, the keys of the numeric keypad are somewhat smaller than those of the keyboard (width: 15 mm; 18 mm with base). The mouse replacement surface sits on an obvious hollow. The pleasant matte skidding Synaptic-Touch-Pad V7.4 is not particularly large (88mm diagonal) but is sensitive up to the edges. The mouse replacement has a vertical and a horizontal scrollbar, but is only visually marked vertically. Horizontal rolling is deactivated in the as-delivered configuration. The mouse keys are made of hard rubber and thus give a very good grip and prevent slipping. Their hub is exceptionally large which makes them seem to rattle at first. But after some time, the great movement of the two keys proves to be an advantage in speeding up work with the mouse pad. The WXGA display of the ProBook 6555b has a rough resolution of 1.366 x 768 pixels. The Samsung panel (type Samsung 156AT05-301) has an anti-glare finish which means that users don't have to worry about any reflections. Demanding users who want a large overview on the desktop will look toward the WXGA++ 1600x900 alternatives (WD722EA, WD723EA) which can be had starting at just under 800 Euros. 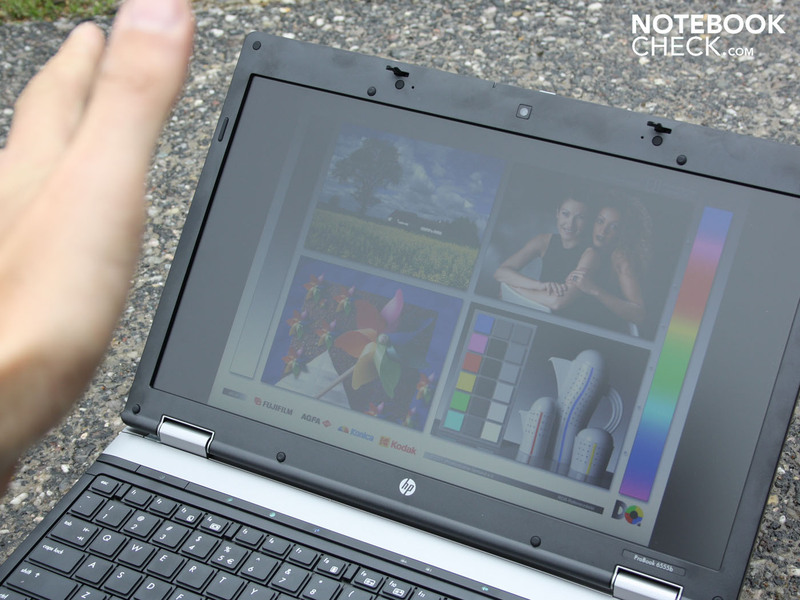 Color space and contrasts are reminiscent of lower-priced consumer notebooks and are unfitting for professional image computing. First off, there is the limited contrast of 142:1. Even with the naked eye one can recognize notable grey elements in the black. Colors are relatively washed-out and don't illuminate. The color space is far removed (57% coverage) from the much-used Adobe RGB 1998, and this also goes for Wide Gamut (31% coverage). At best, the Samsung panel still covers the sRGB with 83%. 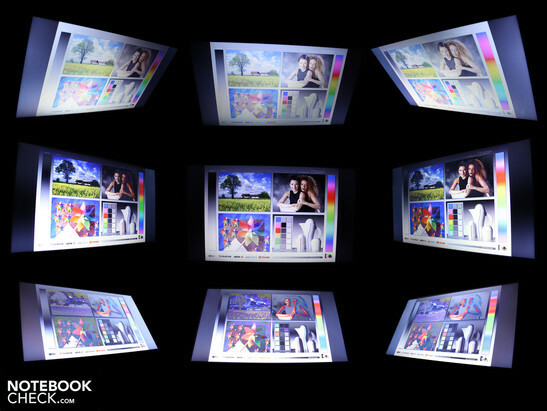 Buyers interested in picture editing or print processing will be turned off right away by the limited WXGA resolution. The LED backlighting of the 15.6" display illuminates the panel to a maximum of 219 cd/m². That is more than enough for indoor use as around 120 cd/m² would be enough here. The average value is around 199 cd/m². The illumination is not very even at 79%, particularly in the upper portion, where the brightness drops to 172 cd/m². But this difference is only recognizable to the naked eye on black or very dark surfaces. Optimal use under daylight is, in theory, possible with the anti-glare TFT panel. But under direct sunlight, we quickly notice that the brightness is still insufficient. In addition, at best the average luminance is of 199 cd/m², there is also some dimming during battery operation. The luminance falls by around 14 cd/m² to 198 cd/m² (middle). 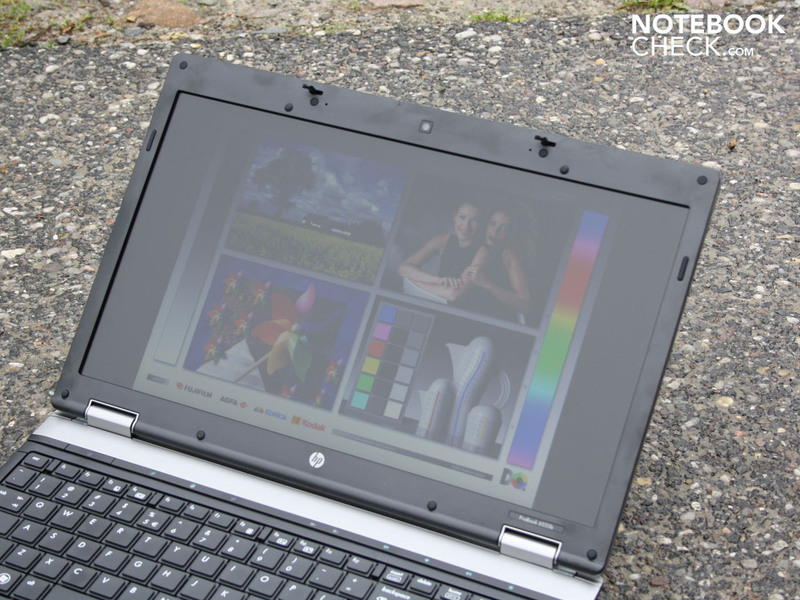 The ProBook 6555b is therefore only marginally suited for use outdoors. 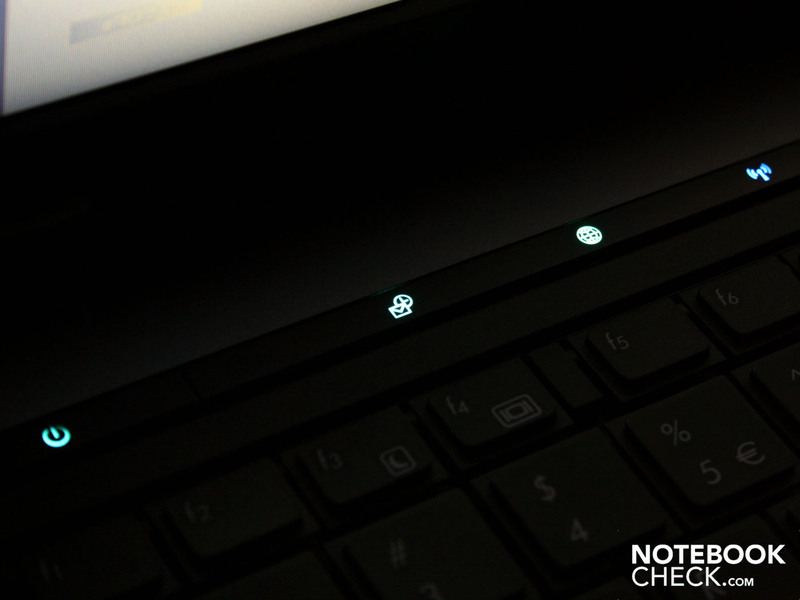 But those with a power adapter nearby can actually do something with the matte display. Wide viewing angles are important so that the user can read colors and writing at a set brightness from the side or above. Office notebooks in the WXGA format typically have very limited viewing angles. 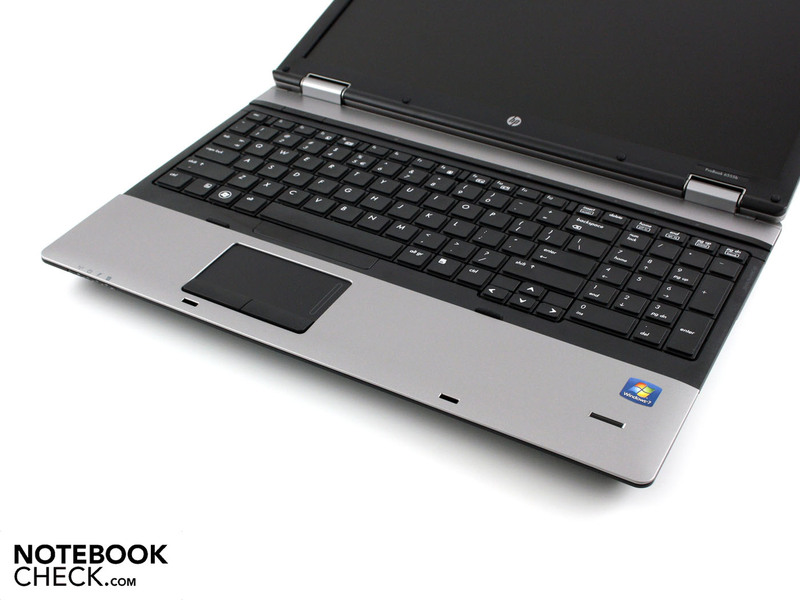 The ProBook makes a name for itself and breaks out from the masses. When moving horizontally, color distortions appear first at 70 degrees. But the display darkens significantly already at around 40 degrees. Vertically, one's eye can move up to 15 degrees, but from that point on, the colors begin to invert quite a bit. Writing is no longer readable by at least 20 degrees of variation from centre. The ProBook 6555b can't offer the stable viewing angles of a desktop TFT. Three cores in the notebook? That which has only be done for a short time by AMD in the desktop arena is now available for mobile systems with the Phenom II X3. Mobile CPUs from Intel are limited to one, two or four cores. AMD closes the gap with its mobile Phenom X3 processors which are produced in the 45nm configuration. Those who have little use for them can opt for two (XA692AW) or four AMD cores (WD725EA) on the 6555b. The Phenom II N830 has a large cache of 1.536KB, but no L3 cache. In that way, though the L2 is larger than on the Core i3 (512KB) or Core i5 (512KB), it is up against L3 dimensions of 3.072 KB (Core i3/i5). Is this point alone enough to prognoses a performance disadvantage for AMD? We compared the Phenom II X3 N830 with the rivalling Core i3-330M (2 native & 2 virtual cores, 2.13 GHz) or the Core i7-720QM (4 native & 4 virtual cores, 1.60 GHz) in the synthetic benchmark tests. The N830 got 1.18 points (multi core processing) in the Cinebench R11.5 CPU test. That is on level with a low voltage core i5-520UM, a CPU which is even built into 11.6 inchers. i3-330M CPUs get around 1.8 points, that means they process decidedly faster. i5-520M dual-cores are at around 2.0 to 2.2 points, and a i7-720QM operates almost at light speed: 2.6 to 3.0 points. In other multi-core benchmarks, the differences are not so blatant, but still there. In the 3DMark Vantage CPU score, the N830 (5.231 points) cuts a reasonably good figure, but an i3-330M (6.150 points) computes even faster. The N830 is also miles away from the 520M (7.500 points). With 10.100 points, the i7-720QM even processes almost double so fast. In the multicore rendering of the Cinebench R10 (64bit), an i3-330M (6.534 points) outpaces the N830 (6.116 points). We should remind you: The i3-330M processes with four threads. Clocking and the efficiency of the architecture play the most important role in the singlecore rendering of the Cinebench R10 64 bit. The i3-330M (2.751 points) and the i5-430M (3.400 points) are faster than the N830 (2.284 points) despite having almost identical clocking rates. However, single-core comparisons haven't been realistic portrayals of the system-related performance of a processor for quite some time, as multitasking dominates PC work. The PCMark Vantage overall score of 4.081 points is disappointing. Intel systems with i3-330M serve up 4.500 to 5.000 points and still don't even have a fast 7.200 RPM harddrive. i5-520M notebooks top the podium with 5.500 to 6.900 points. The PCMark Vantage determines the system performance and takes HDD, GPU and RAM into consideration. 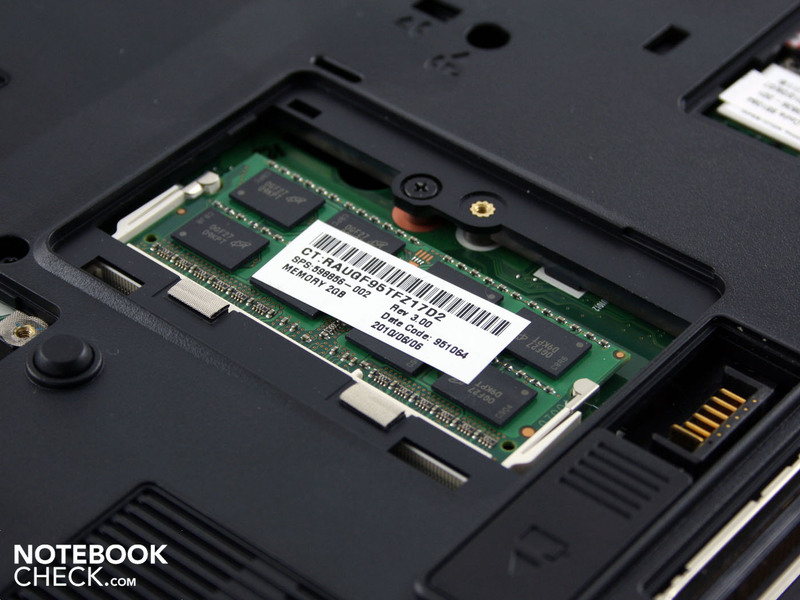 The fast HDD provides the 6555b with a few extra points, which we have witnessed on the Acer Aspire 5551G (3.995, HD 5470). The missing support of a strong graphic card hardly has any relevance for the overall score of the benchmark test. 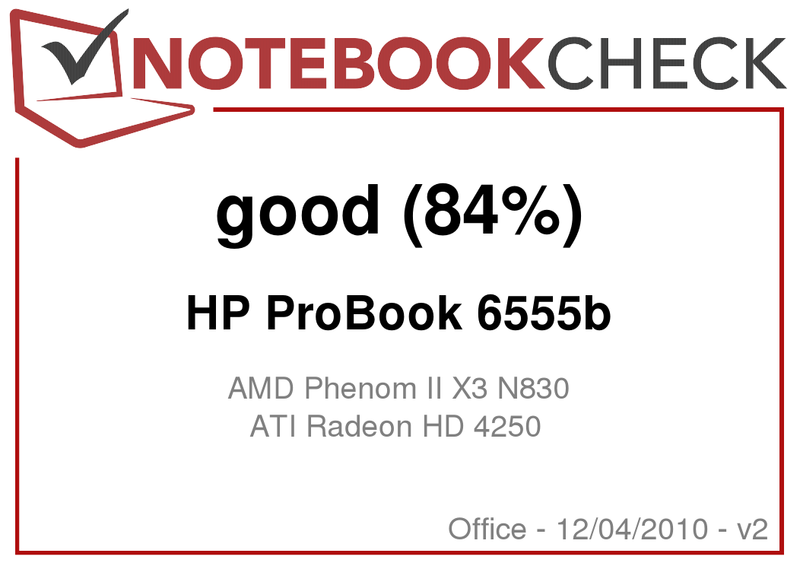 A look at the Acer Aspire 5625G-P924G50M (Mobility Radeon HD 5650) with Phenom II X4 P920 (4.151 points) shows that the weak system performance is due to the system itself. Therefore, a strong GPU wouldn't have helped the N830 much. However, we don't want to sling too much mud at the application performance here. 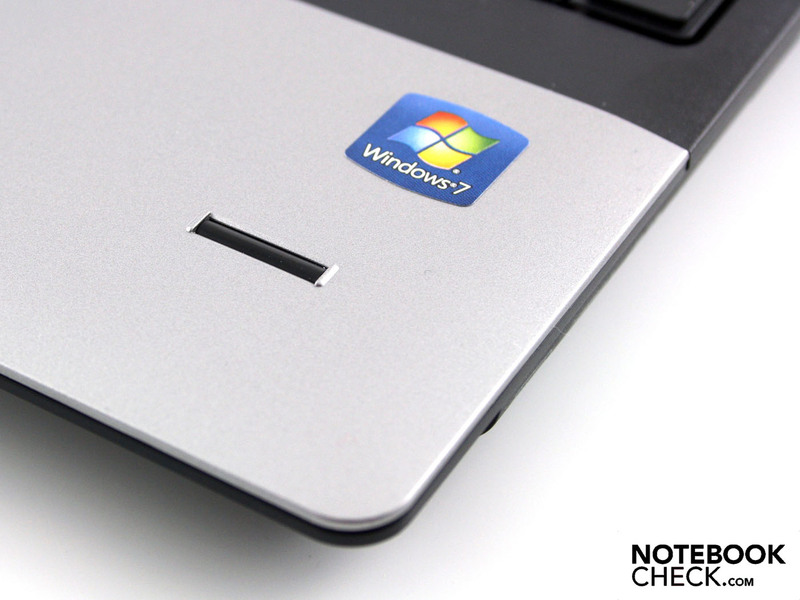 It is on level with stronger notebooks from 2009 like the Toshiba Satellite P300-212 (T9550), the MSI Megabook GT627 (P8600) or the Sony Vaio VPC-CW1S1E. Multi-core applications certainly benefit from the third core of the AMD Phenom II X3 N830. But on balance, the Intel processors of the 2010 generation with hyperthreading and Turbo Boost process faster. That a fast harddrive can be a blessing for the speed of the entire system has recently been proven with the Sony Vaio VPC-Z12 with its two SSDs in the RAID 0 combo. HP didn't want to go so far. But still, a fast 7.200 RPM harddrive from Hitachi (HTS725032A9A) works with a gross capacity of 320 GB in the 15.6 incher. The HDD reads data with 81.9 MB/s from the drive in the Sequential Read (HDTune). The Crystal Disk Mark 3.0 even brings a throughput of just around 98 MB/s to the plate. These numbers aren't changed significantly when scripting larger data sets: just at 97 MB/s. Normal 5.400 RPM HDDs are at best at 75 MB/s (sequential read). In operation, the HDD is only audible with a constant base noise. The read-write elements produce a subtly audible rattle with 33.1 dB(A). The drone transferred to the tabletop which we witness on the HP ProBook 6540b no longer exists. The ATI Radeon HD 4250 graphic core is based on a DirectX 10.1 capable HD 3400, but it is not suitable for current games. We tried out StarCraft 2 (2010, real-time strategy), World in Conflict (2007, real-time strategy) and Left 4 Dead (2008, ego shooter). As expected, all of these games run fluidly on the lowest settings. The actual point of this GPU is to support the processor in video decoding (UVD 2) on HD videos (MPEG-2, H.264, VC-1). Small computing tasks or demanding operation with Web-surfing rarely brings the fan out of hibernation. When idle, the cooling system remains inactive for a long time and only goes on for 30 seconds every five minutes (34.4 dB(A)). 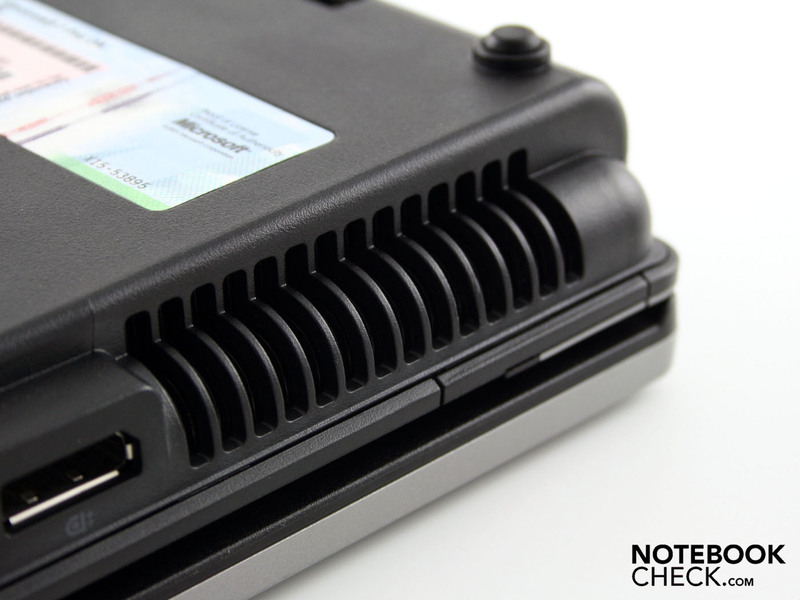 However, the 6555b is not inaudible as the 7.200 RPM HDD provides a constant base noise of 32.6 dB(A). On the 3D-Benchmarks, the volume only goes up to 35.2 dB(A). This goes for applications which put significant demands on the HD 4250. But because of the GPU's unsuitability for gaming, this scenario is seldom. If we operate the notebook under full load, the fan spins to an almost deafening level: 46.4 dB(A). Still, the noise remains constant and there are no changes. This maximum operation volume shouldn't cause for much concern since as we developed a level of load with the Furmark and Prime95 which should never be reached, even in demanding operations. In office operation, we are pleased by the maximum volume of 35.2 dB(A). A light spinning noise while playing a DVD did bother us. It is emitted from the DVD driver and is at 36.3 dB(A) clearly measurable and perceptible to the ear. At idle, the average temperature on the underside is at a commendable 28 degrees. The palm rest also remains in the green zone with around 28 degrees. The base plate can reach 38 degrees in the middle which could be the result of some heat traffic caused by the particularly inactive fan. The cool palm rest and the at most luke-warm keys leave a pleasant impression. Does the roaring fan under full load we mentioned above help to keep the temperature at bay? This is the case for the working area. Even after a stress-test over several hours, the temperatures on the upper surface didn't rise over 35 degrees Celsius. In the meantime however, it was burning out pants as the maximum surface temperature was measured at the middle of the underside: 53.1 degrees. This is the lid for the memory, which itself appears to get quite hot. But the areas around there (underside) remain surprisingly cool as the reckoned average temperature was only around 38.4 degrees. 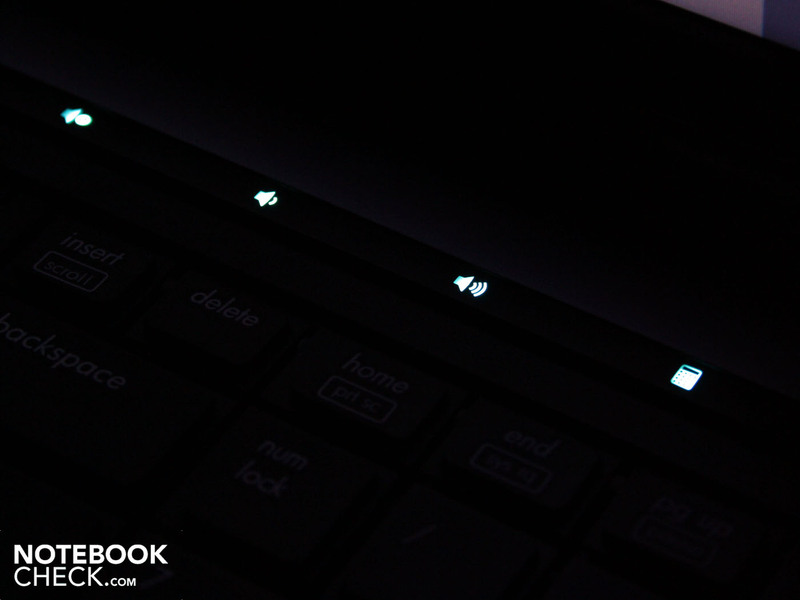 The stereo loudspeakers of the ProBooks produce a surprisingly clear sound. They are found on the frontside of the machine. Mid and high tones are delivered quite well, but deep tones are missing entirely. At the highest volume, the tiny membranes begin to scratch and distort. But even without raising the maximum level, the volume is sufficient for office duties. External speakers can be plugged into the 3.5mm headset output. We tested the port with two Yamaha speakers (YST-M20SDP). The high definition audio controller in the AMD RS880M chipset delivers a good resonance level which hardly rustles. The external speakers can thus be operated without any extraneous rustling. 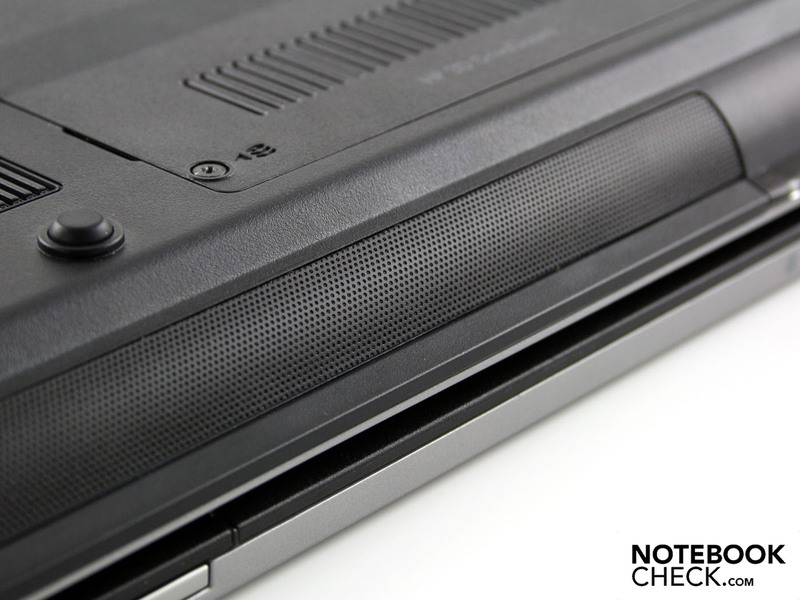 Compared to the Intel version of the ProBook 6540b, the sound has improved a great deal. We assume this has to do with an improvement on the sound cards or their drivers as the same speakers are probably employed in the identically constructed chassis. 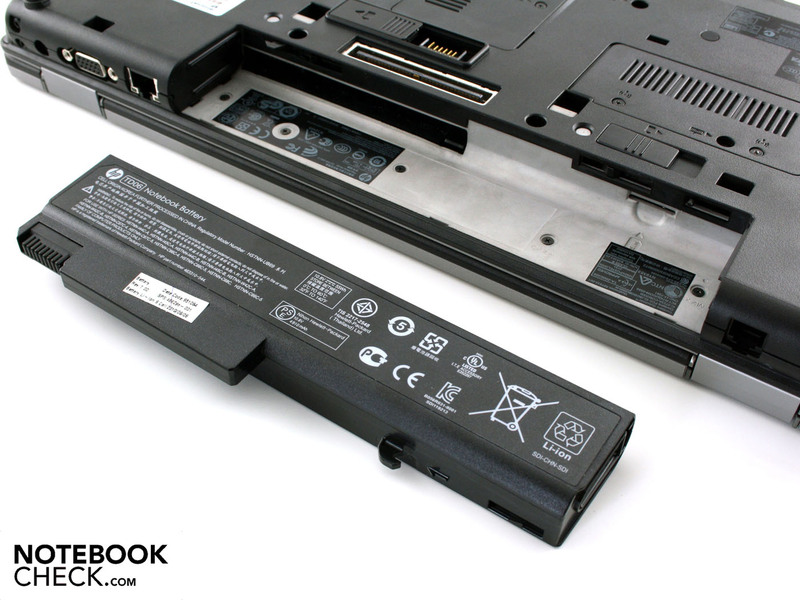 Like its Intel rival, the 6540b, the 15.6 incher is equipped with a 55 watt hour battery (4.910 mAh). This keeps the AMD system running up to 303 minutes (5 hours). But here we are dealing with an at-idle situation in which no demands are put on the processor and graphics. Radio modules are out and the brightness is on its lowest level (BatteryEater Reader-Test). A more realistic runtime is achieved during a WLAN surfing session. The user can surf the Net for only three hours (173 minutes) before needing to grab for the 90 watt power pack. Out Intel-based 6540b tester got a runtime of 4:12 hours (252 minutes) despite the dedicated GPU. The brightness during the test was on the minimum level of 100 cd/m². What is interesting are the runtimes possible when using the internal HSDPA modules: 152 minutes (2:32 hours). In this we had an EDGE connection and the luminance was once again 100 cd/m². The runtime of the AMD-based 6555b also loses a lot of ground on the Intel-based 6540b (i5-430M). Considering the IGP graphics in the 6555b, the result seems particularly poor. A HP EliteBook 8440p-WJ681AW with Intel HD graphics but still strong i5 520M stays on its feet up to 287 minutes (4:47 hours), (WLAN-test, 55 Wh). The comparably high energy needs (idle and load) confirms the so-so battery life. At idle (with all energy savings options exhausted and a minimal luminance), the current consumption was similar to the 6540b (i5-430M) with 13.7 watts (13.3 watts). But the maximum current consumption at idle (profile high-performance without under clocking of the CPU) really makes itself known with 27.8 watts. The Intel comparison 6540b is more frugal here (21.4 watts). As soon as CPU and IGP graphics work together, the current consumption rises dramatically. 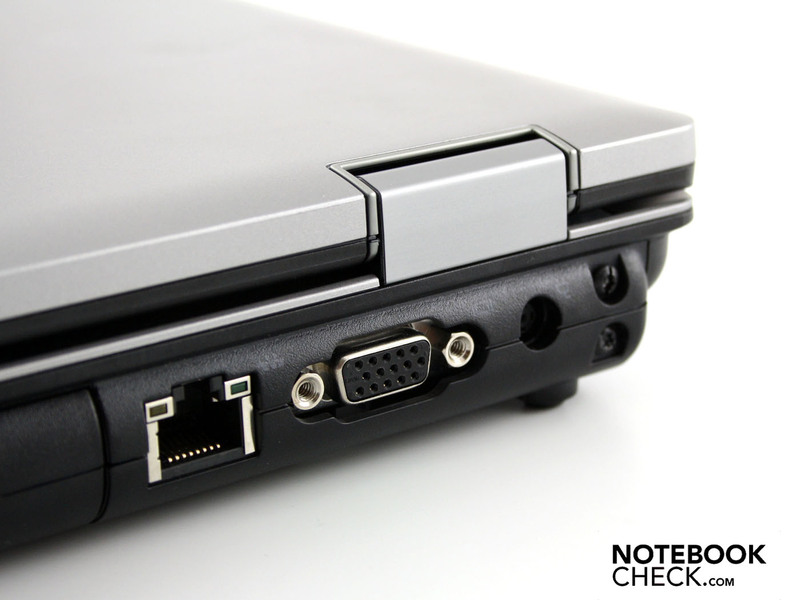 During the 3DMarks2006, the system the whole notebook needed 52 watts. We determined the maximum current consumption in the stress-test with Prime95 and Furmark. The multimeter showed 74.6 watts. The 90 watt power pack is dimensioned fittingly. 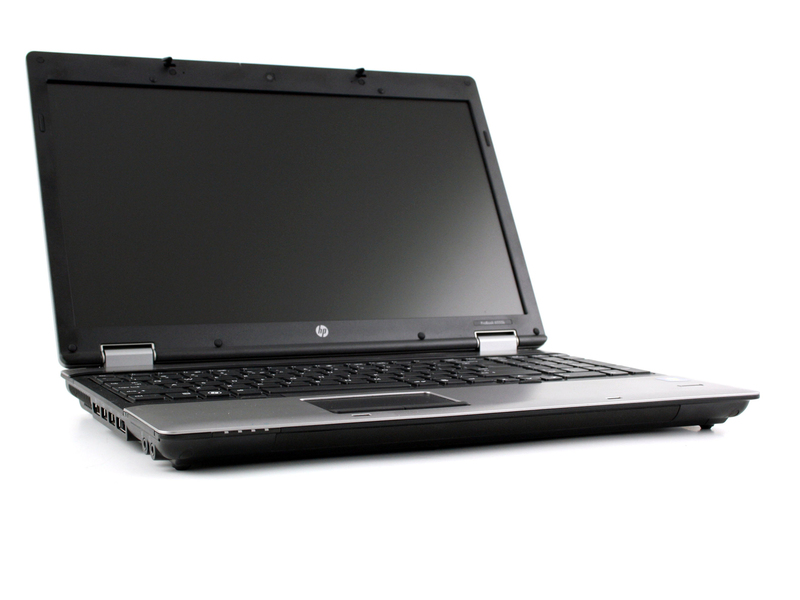 The HP ProBook 6555b-WD724EA presents itself as the upper class of business mainstreamers. Equipped with all trimmings like Docking-Port, a matte display, HSDPA module or the excellent keyboard, the first impression remains undiluted. The AMD platform even exceeds the externally identically constructed Intel Variante 6540b with an eSATA port, improved sound from the loudspeakers and a low-vibration 7.200 RPM harddrive. At a price of 840 Euro, our 6555b-WD724EA tester is a kind of entry-level model in the world of ProBooks. The WXGA panel with its small color space and the limited contrasts is certainly not to everyone's liking. There is also the AMD Phenom II X3 N830 processor, which probably can't deliver enough power for computing-intensive application. Despite the more limited performance than the Intel based 6540b (i5-430M), the 6555b has a shorter battery life (3 hours, WLAN test) and a somewhat higher current consumption. 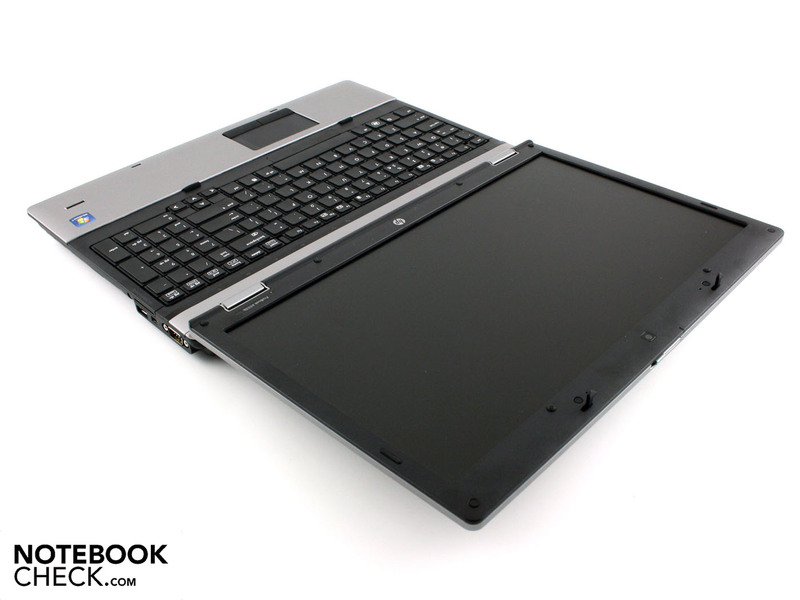 Those who don't orient their demands on display quality and processor power, but rather on the connectivity, construction and input devices, the ProBook 6555b could represent the ideal companion. But those who see themselves as power-users should invest a bit more money and switch over to the Intel camp of ProBooks. 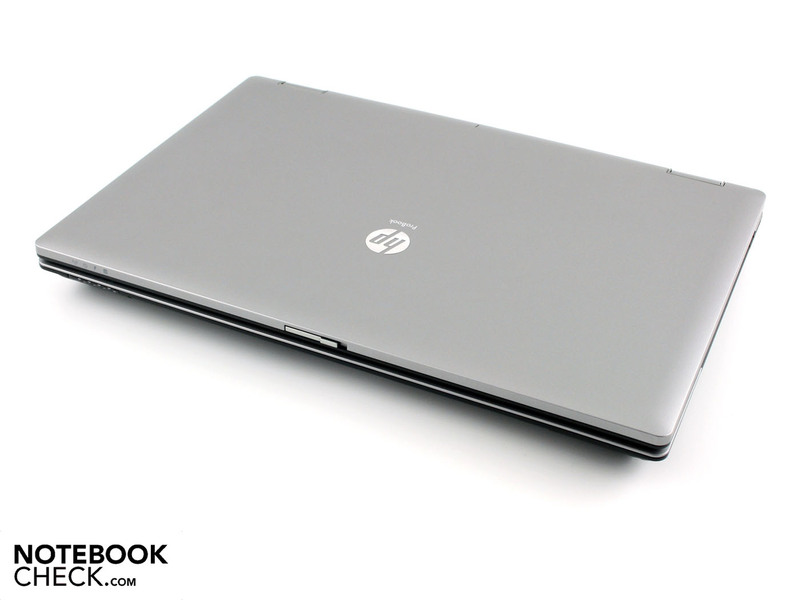 The HP ProBook 6555b is a serious office companion without gimmicks like dedicated graphics. ...the Soft-Touch keys for radio modules, volume, calculator, outlook etc. the Hitachi harddrive (2.5", 320 GB, 7.200 RPM). and keeps the machine on its feet for up to three hours (WLAN-surfing). The power pack is relatively small but not light: 352 gr. It delivers 90 watts and is thus suitably dimensioned for the max. energy consumption of 75 watts. With the integrated HSDPA module, including GPS positioning, users can also connect to the Internet while on-the-move. Unfortunately, the SimCard is quite securely wedged in. The fingerprint-reader allows for biometric logins. The bulky but sturdy and matte design characterizes its style. At 2.727 gr., it is one of the heavier 15.6 inchers on the market. Case and also the hinges (metal) give an impression of durability. The mouse-gray optics offer no real attractions - no bravado to distract one from working here (loudspeakers). 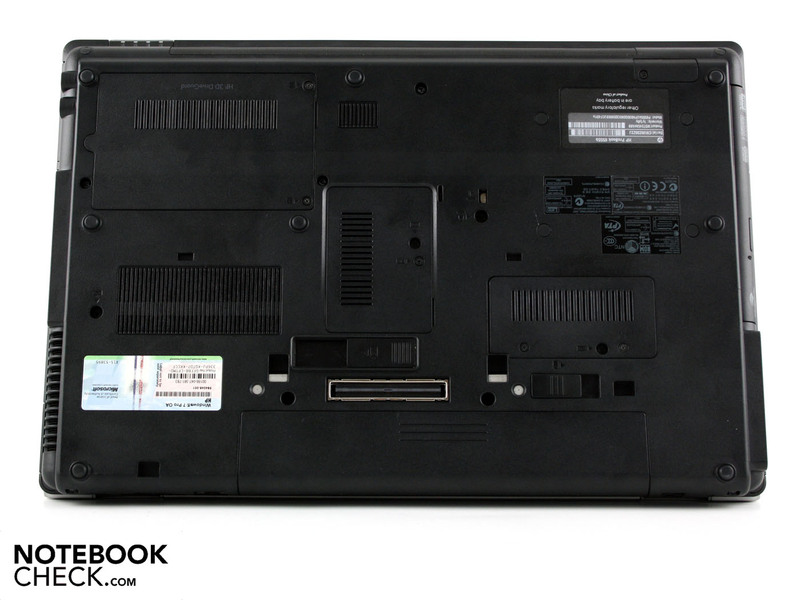 What the ProBook 6555b offers is an abundance of connections including docking- and battery slice port on the underside. There is also a quiet operating noise - that is unless the AMD N830 runs under full load (air outlet). And of course it can't forego a matte display (WXGA). such as a VGA (D-Sub) at the rear. A serial connection (D-Sub RS232, 9 pin) will be a treat for technicians who can use it for instance to control and monitor machines. 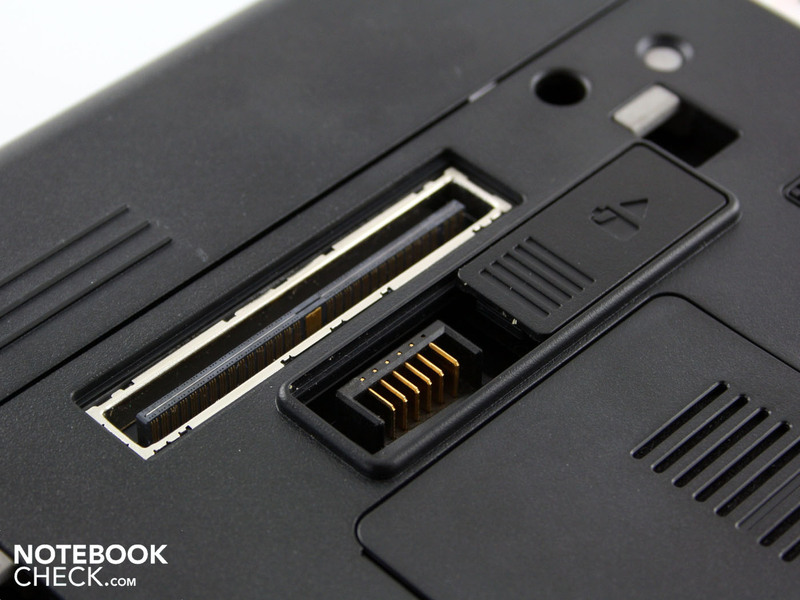 The ExpressCard/54 slot supports its expandability (ex. controller). Focus on the core components. It does without an unnecessary dedicated graphic card, but a UMTS module is integrated. An AMD processor on level with the Intel Core series. 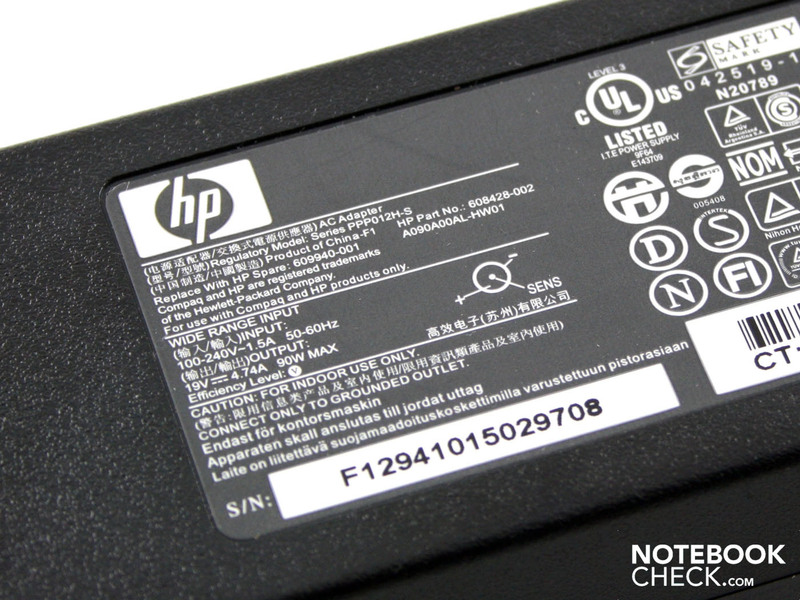 HP effectively eliminated vibrations from the 7.200 RPM harddrive.